I have never seen a bumper sticker that says “Honk if you love merlot.” But there should be one. It is a wonderful grape that produces some of the best wine in the world, a wine that pairs well with a variety of foods and is one of the most approachable red wines. But for many wine drinkers their knowledge of merlot begins and ends with Miles in “Sideways,” the 2004 movie that boosted pinot noir at the expense of merlot. He refused to drink merlot because his ex-wife loved it. Sales of merlot dropped and pinot noir sales soared after the movie. Winemakers around the world are fighting back by celebrating merlot month in October. If you want to join the fun, try some merlot and then use the hastag #MerlotMe in social media posts. 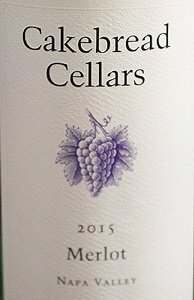 I’m starting the month off right by tasting the 2015 Cakebread Cellars Merlot ($53-55), a spectacular wine that pairs well with some of my favorite foods. At this price it is not going to be an everyday wine, but it is worth a little extra expense for a special meal. Jack and Delores Cakebread have been producing wine since 1973, and I have been a fan since the early 1980s. They started out small and grew their business slowly by making fantastic wines. Though more famous for cabernet sauvignon, chardonnay and sauvignon blanc, their merlot is among the best. They have been producing merlot since 1991. The 2015 vintage is a rich, supple wine, full of ripe dark fruit flavors. I picked up black cherry and blackcurrant aromas followed by flavors of blackberry and plum. Characteristic of merlot, the tannins are muted and well integrated. The long, smooth finish ends with fruit and mineral notes. This is one of the lushest, ripest merlots you will find without the wine being cloying or jammy. Everything is in perfect balance. While the wine is wonderful now, it should continue to improve in the bottle for another 5-7 years. The wine is 95 percent merlot and 5 percent cabernet franc, grown primarily in the Suscol Springs Estate at the southern end of Napa Valley. The vines grow on steep, rocky hills with a southern exposure, producing grapes that have a distinctive acidity that provides the muscle that allows the wine to age well. Each of six separate vineyard lots was handled separately and fermented in a mix of small closed and open-top stainless steel tanks, with pumpovers to extract color, flavor and tannin. After fermentation, the new wines were transferred to carefully selected French oak barrels, 44 percent new, where they aged for eight months before being blended. The blended wine then spent an additional nine months in barrel before bottling, adding to the complexity of the wine. 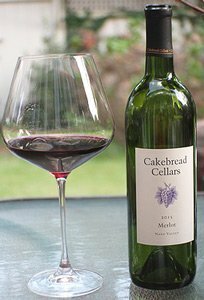 Winery: Cakebread Cellars started out as a small, family-owned winery, and even though its production has grown to 175,000 cases a year, it has remained family owned. While other family wineries have sold to large corporations, Cakebread clings to the values that have made it successful. While Jack Cakebread was shooting photographs for a wine book in 1972 (He studied with Ansel Adams for nine years. ), he stopped at a friend’s house for a bowl of soup at lunch. He casually mentioned that if they ever wanted to sell their land they should let him know. The family called that afternoon and offered to sell Jack and Delores the Sturdivant Ranch in Rutherford, the heart of Napa Valley. They had a tough decision, but used the advance Jack got from the photos for the wine book as a downpayment on the land. While Jack continued to work at his father’s car repair business in Oakland he and Delores planted vines and tended to them on evenings and weekends. After two years of such work the initial winery was built and Cakebread Cellars released 157 cases of its first wine, a 1973 chardonnay. They sold a few cases to a local wine merchant and as people tried their wine, the Cakebread reputation grew. They released their first cab and first zinfandel in 1976. Now they produce cabernet sauvignon, Rubiyat (pinot noir/syrah blend), chardonnay, pinot noir, sauvignon blanc, Dancing Bear Ranch Bordeaux Blend (cabernet sauvignon, merlot, cabernet franc) and Vin de Porche rosé. Distribution is worldwide. Over the years the winery has grown and been revamped. In 1980 a new winery building, designed by architect William Turnbull, won several awards. Sons Bruce and Dennis joined the family business and now run it. The winery has used many innovative techniques, including night-harvesting to ensure the grapes arrive at the winery in pristine condition; whole-cluster pressing of white grapes to enhance juice and wine freshness and varietal intensity; and aging chardonnay in barrels on its spent yeast lees – a traditional French practice known as sur lie which produces a very rich, creamy style of chardonnay. Cakebread Cellars is a green-certified winery, and its vineyards are green-certified and either farmed organically or sustainably. Today, the winery owns 15 sites totaling 1,617 acres, 584 of which are currently planted. This was a great pairing, especially for an outdoor meal. 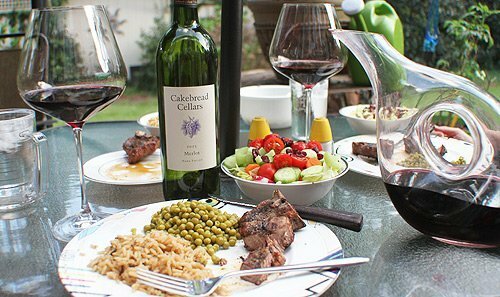 Goes with: We had the Cakebread merlot with grilled lamb chops, wild rice, peas and a salad. It was a great pairing. The intense fruit of the wine smoothed out the sharp lamb flavors. I cooked the lamb on a medium-hot charcoal grill, about 5-6 minutes per side. They came out juicy and flavorful. The wine brought out the best flavors of the lamb, and each bite of lamb made me want another sip of wine. What a wonderful pairing. This wine also would go well with port, pheasant, duck and veal.